The morale issue has held steady, but I have received reports of continued grumbling- if no increase in such. Additionally a member of the crew on deployment has requested emergency dismissal. The reason they offer is that they have family in Dallas, Texas that they are concerned for the safety of in light of the EVD (Ebola) cases discovered there. Efforts to reassure them that there is little reason to be alarmed have apparently fallen on deaf ears. Still, I suspect it may be a worthwhile gesture to grant the request. Honestly, in reviewing the case I am not entirely sure I would feel any different in their issued boots. The authorities seem to be more concerned with public image than with the very dire threat the hemorrhagic fever presents. So, I have decided to pay the construction site a visit employing one of our prototype cavitation submarines. This presents an opportunity to demonstrate graciousness as well as ensure morale is high by other means. In addition to delivering a replacement Henchperson to replace the Texan (#717453254) so as not to add any strain to the present shift rotations I shall also deliver my personal Chef to augment the services of the Cafeteria for the next month. I fully expect Henri to prevent any further complaints. Going back to the present EVD issue, back when I was tempted to maintain this as a more conventional blog I wrote of a possible solution to the African epidemic which largely consisted of shipping America's Faith Healers to Africa. 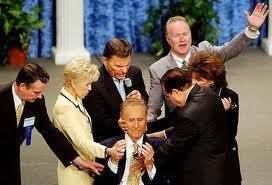 At least two of these Faith Healers were based in Texas. Well well well. It seems if Mohammed won't go the the Mountain, the Mountain must come to him. If anyone must die in Texas from Ebola, let them not be innocent. Won't someone call the Copelands? While I am attending to this affair I may not find time to add a further entry until my return. Should I make this public later and you should be interested in the Faith Healer solution, I do have the writing preserved and will make it available on request. I was fairly pleased with it at the time at least.